Earn 5799 loyalty points when you order this item. Luxman L-507uXII integrated amplifier earns its Mark II status by combining the knowledge and experience of developing refined pure Class A integrated amplifiers with state of the art technology. The L-507uXII features the New LECUA 1000 attenuator and a discretely configured buffer circuit as well as the Version 4.0 ODNF original feedback circuit from Luxman to achieve spatial expression, overwhelming power and clarity that is comparable to a separate amplifier. Technology has progressed but the philosophy remains the same.The L-507uXII represents a quantum leap in integrated amplifier design and reflects the global perception of Luxman as the leader in brilliant audio expression and reproduction. An integral part of the design of the L-507uXII is Luxman’s original ODNF amplification feedback circuit. This features a fast-primary slew rate and an ultra-wide bandwidth that is achieved through the feedback of distortion components only from the amplification output circuit. The latest version of ODNF–Version 4.0–is used, resulting in a dramatic enhancement of accuracy in distortion detection, lower impedance and a higher S/N ratio due to a parallel first stage and Darlington connected second stage of the amplification circuit, as well as a 3-parallel first stage error detection circuit. A 3-parallel push-pull structure output stage achieves complete output linearity of 110W+110W (8Ω) and 210W+210W (4Ω). This type of circuit can achieve high power ratings that are comparable to a separate amplifier and has the force to drive various speaker systems to deliver high-grade sound reproduction. The New LECUA1000 is the most important part of the pre-amplifier section and handles volume adjustment of sound signals at micro levels. A computerized attenuator, the New LECUA1000 is an integral part of the amplifier circuit and performs in the same way as the high-end C-900u Luxman control amplifier. The New LECUA1000 enables the volume to be adjusted smoothly and finely in 88 steps thereby minimizing the deterioration of the sound quality. In addition, a 3D layout has been introduced in the New LECUA1000 allowing the substrates to be placed in three dimensions. A direct connection between the attenuator circuit and the amplification circuit is made to minimize the signal transmission route and improve efficiency. What is more, this type of design is insensitive to external vibration, eliminates any change in sound quality depending on the position and durable so that it will not decline with the passage of time. 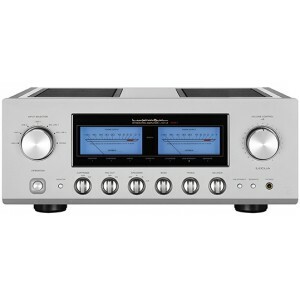 The L-507uXII features a new discrete, embedded buffer circuit mounted on the output stage of the pre-amplifier circuit that is equivalent to the type used in the high-end C-900u. This helps to protect the purity of the audio signal whilst enhancing the drive force of the power amplifier unit. New customised gradation cast iron insulator legs that are used for the Luxman 900 series separate amplifier are fitted to eliminate resonance for the L-507uXII, taking thorough countermeasures against vibration. The solid loopless chassis with thorough grounding adds to the structural stability and therefore sound quality.